D&D Classics: Every Edition on Sale! Very good news from Wizards and the great guys at Drive Thru RPG. It seems like every edition of D&D is now for sale via PDF up at the www.dndclassics.com store. Not all the core rulebooks are up yet, but there are sections for Basic/Expert, 1E, 2E, 3E, and yes, even 4E - and some of the releases are old, out of print rulebooks. This is a great thing, and brings Wizards back up to the times in our tablet and smartphone world. The prices are great too, plus regular sales, very cool. This is a positive step, and one that is very welcome. Credit where credit is due, thank you Wizards and the team out there for making this happen. I shall repeat the call for some of the classics as PDFs as well; such as Star Frontiers, Top Secret, Gangbusters, Gamma World, and all the old TSR greats. You are doing an incredible job with the store guys, keep it up, and they deserve our support. Get out there and play these as well, they deserve to be seen again by new players and new faces! Welcome back to another edition of Design Room, not really a review of a number of gaming books, but more of an in-depth look into the game design aspects around a series of books and the implications on game play. For reviews, I shall steer you to other sources, like Amazon, we are interested primarily here in game design, theory, and impact on referees and players. Today we look at one of the biggies in a retrospective, D&D's Eberron game world. It is important to note that Eberron is still the setting of games like D&D Online, but it doesn't seem to be getting any D&D Next love as of yet. It had a number of 4E supplements, which we will get into, but the fate and status of the world is very much up in the air right now. It is not a good thing, Wizards has far too many worlds to support for the company's focus, and it leads to none of them being supported all that well. 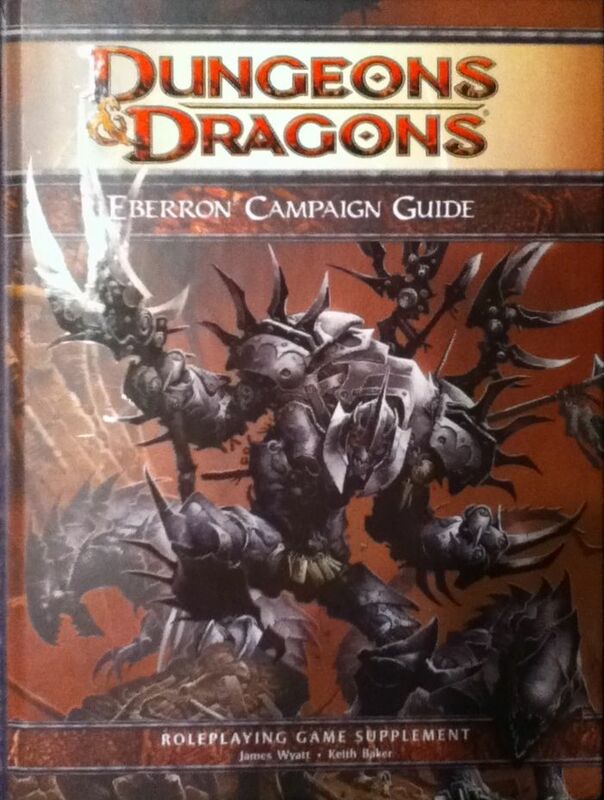 Let's start with the D&D 3E Eberron Campaign Setting as the starting point for our delve into the world of Eberron. Mind you, this is not a complete review, nor can we cover everything, we will be hitting some high-level stuff, and reflecting upon the world and game design implications and consequences of these choices. Eberron started out as a contest-winner in the D&D3 days of a 'create a new D&D game world' contest Wizards put on in the waning days of D&D3. Why they did this is strange, they already had a number of incredibly well designed game worlds, including Faerun, Greyhawk, Dark Sun, and the shelved worlds of Mystara and Birthright. One thing you need to remember was this was the heady days of the beginnings of a number of modern MMOs, and the bug one at the time was World of Warcraft. Perhaps Eberron was the first step to making D&D relevant to that crowd, a fantasy world with steampunk elements with an over-the-top look sounds a lot like...World of Warcraft to me. If true, this makes Eberron the first D&D4 product released, a change in tone from what came before, and also a clear statement of change in the direction of the product. Eberron is very much one of those worlds that never really had a place. Faerun was the home of the big-money fiction, and Greyhawk was the official setting of D&D3. This seems to harken back to the old TSR's habit of creating too many game worlds to support, and D&D3 always had this multiple-personality complex where the main books were heavily Greyhawk-centric, and the other worlds were' oh yeah, them too' add-ons. Eberron seemed the least-liked child, but it was definitely the most unique and cool. A smart choice would have been to keep all the Greyhawk stuff out of the main three books, and support all worlds equally. You shall see this 'what world do we support?' question come up later, so keep this in mind. The MMO elements are clearly here, a number of strongly rethought races with motivations and a unique flavor, a ton of internal orders and organizations which fight and shift alliances, and a number of pseudo-governments that serve as the backdrop to the larger conflicts. It is important to note that point, the governments of Eberron are backdrops, thematically, they aren't as important to the world as the major players, the Dragonmark Houses being the largest and best defined, followed by all the local factions unique to each kingdom. Again, this is like your typical MMO, and again World of Warcraft. While major nations can fight and even the players can take part, for the most part, the big stories are with the organizations that control the world, and most of these reside between and even above the governments. The kingdoms are 'zones' and the interesting action happens across them. There is a balance between governments and power groups in the campaign guide which is interesting. The government is given one section, and all the power groups their own following. This is done for every major area of the world. This tells you two things. The first is that unlike other game worlds, the big players are the power groups - they are clearly given more weight than the governments. While a power group may be itself the government, this is not supposed to be a forever thing, different groups can get the upper hand and control the government. It is a fluid and dynamic situation that is clearly different than any previously published D&D game world. The second is that this is a game about these groups and all the plots between them, again, the governments are supposed to take a back seat to the games these groups play. Again, you can find a mirror in World of Warcraft, with groups like the Cenarion Circle, Order of the Silver Hand, the Guardians of Hyjal, Hellscream's Orcs, and all the other classic WoW factions. Orgrimmar is a kingdom, yes, and it has a government and background all its own - but who controls it on any given day can shift and change depending on what is currently going on between all the background groups that are fighting over it, playing politics, and running plots. 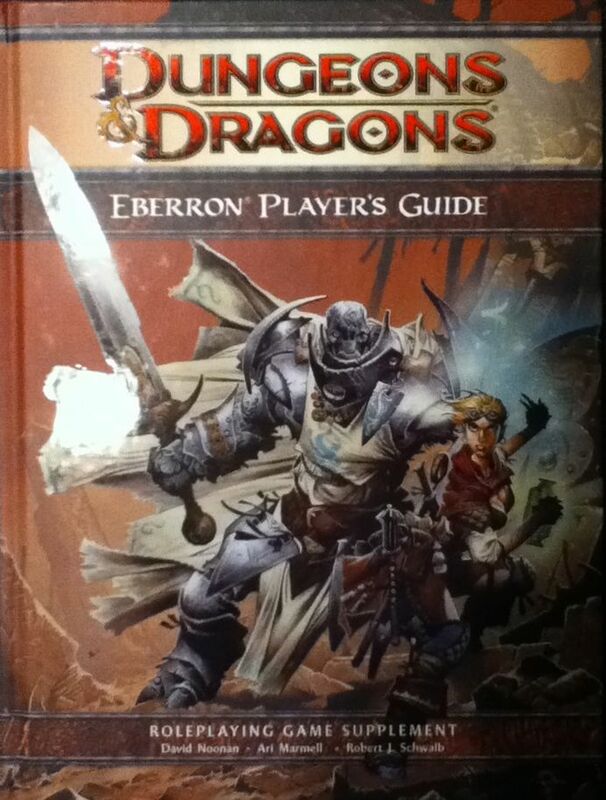 Eberron is the same way, and it is important to understand. Friends characters make in one kingdom may or may not be there when they come back, and their political situation may have changed dramatically as well depending on the current stature of things. Contrast this with other D&D game worlds, where nothing much changes. In Faerun we get the stereotyped belief of, 'Oh I can always go to kingdom X and contact NPC Y for help, they are always good, and enshrined here by the fiction.' In Greyhawk, the same can be said, although it is typically, 'Oh, Kingdom X is lawful good, that is a safe place and they can help.' In Eberron, nothing is guaranteed, and if the players want change, they will need to get out there and do the leg work to support the factions on their side. Note this point, this is clearly the #1 most important thing about Eberron and why it is different than any other world that came before - or after. Another clear point of differentiation between Eberron and any other world is the 'WOW' factor. Throughout the original 3E Eberron book, a series of incredible art pieces lays out the world. Cities aren't boring concentric castles surrounded by urban sprawl and squalor; they are grand matte paintings of towers built on top of spires of rock, floating castles, cities built in alien ruins, and a whole imaginative smattering of out-there ideas. It is perfectly normal in Eberron to have cities built in underwater domes, in the middle of volcanoes, built on the underside of floating mountains in the sky, on crawling robots made out of stone, floating on rivrs of magical ley lines, warping in and out of reality, or anything else you can imagine. Similarly, temples, ruins, fortresses, and any other adventure locale can be just as way out there and cool, and in fact - it is expected. We can go as far as placing monsters and magic items under the cool umbrella as well - these need to be unique, fun, different, and engaging. If it is not cool and unexpected - it is not normal. This is major point #2 about the world, note this. One of the cardinal rules of Eberron goes like this, "If it is in D&D - it has a place in Eberron." Note that for some things in D&D, like the Drow, they get pushed to the side in this world, they are clearly not as important as they are in either Faerun or Greyhawk. This brings in a lot of material, for good and bad. On the bad side, it is a very chaotic world, with a lot of stuff going on at once, and a lot for the DM to grasp. The 3E Eberron book does a lot to sort this out, and attempts to give everything its own spot so you don't have too much going on at once. The good part is that this opens up the door for unlimited creativity for the DM. "In D&D" covers a lot of ground, any book Wizards put out, anything from other D&D game worlds, D&D Modern and Future stuff, anything from third-party publishers - anything. You can literally beg, borrow, and steal any idea out there and put it in your game world. This is not only allowed, it is encouraged. Eberron is uniquely situated to be the "game world to end all game worlds" and is written to be that way. The magic in Eberron is uniquely designed. Low-level magic is so common it is ubiquitous, everyone has it, and magic is a part of everyone's daily life. A farmer could have a magical self-powered cart to haul hay, magical robots to tend crops, a magical hot-water tap, and all sort of other pseudo-conveniences taken from the modern world, fiction, or any other source the DM can imagine. High-level magic is ultra-rare, even more so than other D&D worlds. You simply don't have a thousand wizards living in the world that can cast the wish spell willy-nilly. You don't have high-level interventionist NPC spell-casters shaping the world with magic. High-level magic has been pushed back, is rare as Hades, and is a special thing again. Resurrections don't happen every day, bucko. This is another interesting point, and a fun design element. The factions of the world are left duking it out with lower-level spells, casters, and powers. They can't simply scry or cast their way to victory, they have to put boots on the ground to get what they want. This is a good thing, and it keeps the world interesting. See that group of enemy soldiers? They may have a low-level caster or two with them, but they were sent here by that faction that does not get along with you, and they really want to recover that high-level magic artifact before you do. Oh yes, shades of Indiana Jones are back, and they are groups in the world that want those items of power more than you do, and are willing to use force to get them. Cue the music, we need to get in and out fast, Indy. Having high-level magic reduced also makes high-level PCs more powerful and special, and they are now major players in the world rather than 'one in a million high level NPCs.' This also puts PCs at a distinct disadvantage, once you think about it. All these lesser powered factions will start to notice high-level characters in the world, and the pressure on them will increase. Having a high-level PC allied with an opposing faction may cause another faction to try to eliminate the high-level PC just to keep the balance, so the world gets a 'self correcting' power-balance that is a very interesting place for PCs to operate in. All of a sudden, it isn't wise to flaunt your power, you never know who might be jealous of you, and there just may be someone else out there who really doesn't like you all that much for who you are. Come to think of it, maybe the reason this world has limit of high-level magics is because it tends to kill of ff and weed out high-level threats ll its own through the groups and politics of the land. An element of danger for high-level PCs just because of who they are? Unthinkable in every other D&D game world. Major point #3 here, note this. Along comes a new edition of D&D, and things change. Picking up the Eberron Campaign Guide, you will notice one thing right off: where did all my cool art go? Gone are all the cool pictures of floating castles, amazing contraptions, and cities perched on the top of rocky spires and alien ruins. There are a couple, but a disturbing trend happens in the book of normal art of castles surrounded bu urban sprawl and squalor. Where are the cool illustrations of the dragonmarks, especially the large ones? Those took up a huge portion of the book in 3E, and they are now gone. Where is the cool Heavy Metal style Mobius art in the chapter starts? You know, those pieces that gave a tone and flavor to the world, almost like a mature comic book? Gone again. A lot of art was removed here, so much so it changes your perception of the world. Point #2, the coolness of the world, has been severely reduced. This hurts, and yes, some of the original art is maintained, but a lot of the important pieces are lost. In the beginning of the Campaign Guide, we get Sharn, a floating city, and a pretty typical castle on a lake. Most of the rest of the art is the typical 4E 'character battle' art, and not really world-specific. Sharn seems like the only cool place here, and the 'open door' to creating fun adventure sites and cities seems to have closed some. This is a great example between the 3E and 4E books of how art can totally change the perception of a game world, and really needs to be recognized and studied. Even the iconic sections of the area governments and factions have been muddled, done away for and replaced by random adventure seeds, monster stat blocks, mini-adventures, and plot hooks. Another huge step back, and the individual sections for each kingdom just seem like articles in Dungeon rather than something that lays out tense political conflicts. There doesn't seem to be a coherent world anymore, and even though some of the same factions are mentioned, there is no focus, and each area just seems like a single adventure to burn through. If you have both books, compare the worldbook sections. Sure, the 4E maps are pretty, but the 3E books seems a lot tighter on focus of the lands, factions, government, places, and interesting sites. We get huge stat-blocks for monsters, and mini-adventures. The factions are either gone, or moved into the adventures. We don't get the feeling that these places are really fought over anymore, or that anything can change, nor are NPCs that important anymore. The 4E 'War on Powerful NPCs' continues here, with a majority of Eberron's big players missing or sidelined. With no powerful NPCs, and a lessening of the important of factions, something is lost. Could it be, point #1, the focus on factions, is gone? 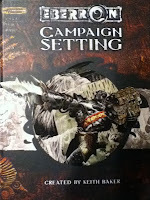 The 4E Campaign Guide is a huge step back. Room had to be made in the Eberron Player's Guide for all those lists of rote 4E powers, and the referee's book has devolved into a copy-and-paste section of DC History checks that take up way too much space. 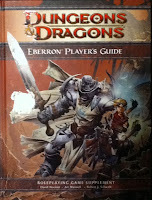 If all you know about Eberron comes from the 4E Guides, you don't know Eberron. 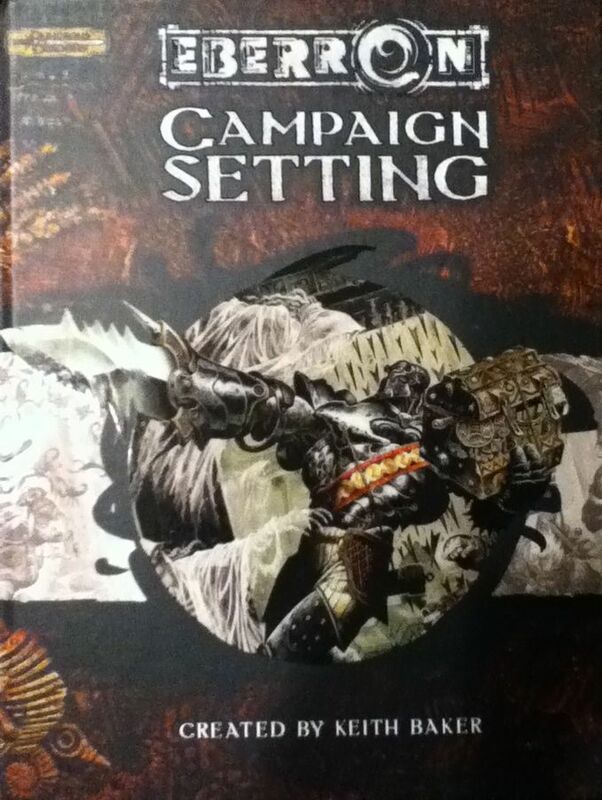 Seek out the original Eberron Campaign Setting book and prepare to be blown away. Granted, I like 4E's rules a lot better for Eberron-style action roleplaying, as they are more cinematic; but then again, something major has been lost here. Once thing you notice is that the art in the 3E Eberron book to a point looks like the art in the 4E books, in fact, most all of the 4E books. It is like Wizards decided to transplant the cool from Eberron and place that into every D&D world - yeah, it is all like that now. I like this tone, but as for putting it in every D&D world? It didn't make much sense in dramatic-novel Faerun, and it surly doesn't fit all too well in old-school Greyhawk. They took Eberron's coolness, turned it into a whitewash, and painted it all over everything they could to make everything seem just as cool. It didn't happen, nor was it correct in many cases. For Nerrath, yes, it worked, and it worked well - but realizing where this cool came from is just as important, and how it can mess things up is another thing. Faerun is more of a LARP-y, dramatic, almost romance-novel world full of dramatic action. Geryhawk is the original gangster of old-school death-trap dungeons, dour and deadly in its outlook and survivability. Dark Sun is even the way it is, different, Mad-Max, post-apocalyptic, and cool. They each bring a unique 'cool' to themselves, but they are not the over-the-top Eberron 'cool' - nor should they be. They each are special, they each deserve their own tone, and they are not the same as Eberron. To do so is to not respect their special culture and flavor of the worlds. You can't transplant a new 'cool' onto a world without a reboot, nor can you make a world something it is not. Magic too, has been changed to the 1 to 30 D&D4 run, where everyone lives in this MMO-style progression path. Gone is the unique low-level/high-level magic disparity, and the world loses yet another interesting and cool aspect. In the old world, level 6 to 8 characters were the movers and shakers. In the new, it seems like we are back to the lets-get-to-30 grind, and we lose that have and have-not fight in the original world. Remember, in 4E you start plane-hopping at level 10, and the original world goes away for the Feywild, Elemental Chaos, and all the other theme parks of the 4E cosmos. In Eberron, the focus is solely on the world - it is the center of the universe, and the place to play in all the way up to max level. All of a sudden, Eberron is just for the first 10 levels of play, and we quickly move in a whole new group of worlds into the mix. This water-down syndrome affects all the 4E worlds, including Faerun and Dark Sun - both of which should not have a Shadowfell and Feywild, but they do, since that is what 4E is, and the game loses something without them. For a world to be the central focus, we need to stay in it. With the loss of magic and clear focus on the world, point #3 seems to be gone too. What are we left with? Something that is definitely 4E, with some of the action-adventure cool, but none of the original fun stuff that made the 3E world so special and cool. Note that some of these things were tied to the original implementation of the 3E rules (like magic level), others were because 4E tried to adopt the Eberron coolness (Faerun, didn't work), and the others I cant explain (the loss of factions and the focus of the world). Part of this can possibly never transfer correctly, like the magic-level, due to the change in rules. The loss of focus on the world's unique faction setup is the most puzzling here. It seems like they used the same model for all of the D&D4 campaign books, the DC History checks, the turning every area into a mini-adventure Dungeon magazine article, and general same-ness of the treatment of each worldbook for 4E. It didn't work for Eberron, and a lot was lost. Another thing was a lot of material just didn't convert in all too well, and some of the most interesting parts were ignored, like the dargonmarks - losing the higher-level art for them was huge. The connection to old-school World of Warcraft is weakened too, while the D&D4 1-30 MMO track is here, the original world inspired by the fantasy-steampunk inspiration seems missing, and all the cool movers and shakers have been replaced by mini-adventures. Remember, the focus of a 4E world is away from ppowerful NPCs, so the 'powerful factions and NPCs control the world' theme of the original Eberron can't happen in 4E - the focus is supposed to be on the adventurers, Points of Light, and the whole 'alone in the world' adventure theme. This is one of the fundamental differences here, 4E's focus is incompatible with 3E Eberron's focus. Part of me thinks they put out too many campaign books for 4E, and maybe they should have just stuck with Eberron as the only and official 4E world. Granted, they needed to keep what was cool and not cut so much art, but then again, it is probably a limitation of book size and format than purposefully limiting content; or they just didn't understand what the 'cool' was here and thought it was just like any other game world, medieval and static. They would have also had to consider Eberron's magic-balance as well, and wrote 4E around that balance. It is an interesting problem, the design of a generic rules system for all D&Ds seems to have gutted the world of its unique mechanics and flavor, even though Eberron was designed under the generic 3E system. Part of the world depended on those items and rules in 3E worked, and in fact, the "anything in D&D" rule is part of that. Eberron is a redefinition of the 3E world in a new and interesting way, a new way to look at things. If all of a sudden, we lay 4E on top of that, we lose what we were looking at in the first place, and the world just becomes another implementation of the 4E ruleset. We are not looking at anything differently here, this is the same 4E, just with different kingdoms and peoples. You also potentially have a situation where players coming into Eberron having played 3E understand the world and what is cool, and players introduced to it via 4E are sitting there wondering what the fuss is about. Why is this any cooler than Nerrath or Faerun, it's all 4E action-adventure, right? Well, people that understand the original source material know, but the new players have a different perspective on the world. Combine that with the loss of focus on the world's factions and unique magic setup, and Eberron becomes another 4E world with nothing really special about it other than two new classes, some magic items, and a map. 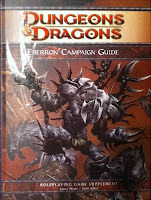 Eberron is cool, and the 4E version is a nice piece of work - but it is not the same world. From a design perspective, there is a lot to learn here about world design, reboots, rules systems transplants, and a whole bunch of other stuff just waiting to be explored. There are two different design goals here, one for 3E to present a new and exciting world, and another for 4E to transplant the rules and theme of the new game into the existing world. Like Faerun, the transplant is not 100% successful - but for different reasons. Examining why this happened tells you a lot about the subjects we study here on the blog, game design, world design, and what makes something interesting and fun. Lots of exciting work going on over on the 7dRPG site today, including a new logo. An explanation of what's going on over there, in short, we are porting a simplified version of the original SBRPG game down into a polyhedral Steampunk RPG. This work will be backported into SBRPG2 when all is said and done, but we felt the need to break things down, simplify, and create a genre-specific game as a base for our future game development ideas. It is a ultra-cool idea, please drop on by and check it out.